Steinel Ammunition offers precision-made 45/70 rounds you can depend on. We make a variety of loads and custom-made-for-Springfields 45/70 Government cartridges that big game hunters, competition shooters, and professionals rely on. 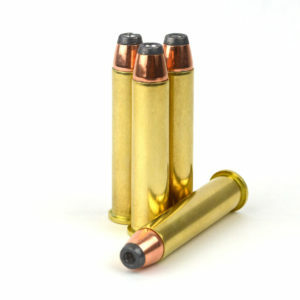 Our 45/70 ammo includes grain ratios that range from 300 gr. – 325 gr. and with different load options such as our unique Goldilocks Load—you can be sure to find the load you’re looking for. The 45/70 has a long history of hunting and military service that began back in 1873. It survives today as one of Steinel’s top-selling rounds for its raw power and accuracy. If you are a hunter looking for accuracy with your lever gun, the 45/70 ammunition by Steinel is a great solution thanks to their advanced engineering and machine work. Our customers report group variances in the 1″ range at 100-yards making this a fantastic one-shot-drop round for hunting. If you are a collector of historical firearms such as the 1873 Trapdoor Springfield like the breech-loading rifles of the late-1800’s, Steinel Ammunition has you covered with a couple different options. Please note: Only “Trapdoor-Safe” ammunition can be used in breech-loading rifles! Through our advanced manufacturing and extreme attention to detail, Steinel offers a variety of ammo for the specialized or common application. Our 45/70 Government ammo comes in 20-round boxes, and two options available in 200-round boxes. 45/70 Government 300 gr. 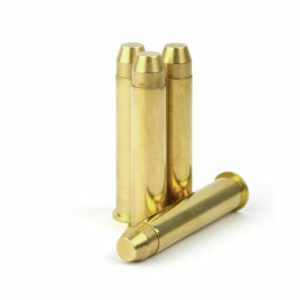 Hornady JHP with Goldilocks Load – This round produces less recoil and allows you to enjoy shooting for the entire day. Expect a power to recoil ratio that is right in the middle. The 45/70 ammo with the Goldilocks Load is perfect for strong action rifles including the popular modern lever guns and sharpshooter rifles. This round is also a great choice for High Wall and Single Shot Guns. However, these are not safe in Trapdoor Springfield Models nor recommended for the BFR Revolver. Other options for these guns are available. 45/70 Government 300gr. Hornady JHP (High Power) – Great rounds start with the best ingredients. The 45/70 Government 300gr. Hornady Jacketed Hollow Point starts with premium powders and is finished with Advanced Manufacturing Processes (AMP) which clearly shows in the rounds accuracy – 1″ groups at 100 yards (see our customer reviews) for accuracy at 200-yards and power in the 2,054 FPS range. 45/70 Government 325gr. Brass Monolithic – with accuracy in the 1.9″ at 100 yards in five shot groups—this sold brass flat point round is perfect with all lever guns. The Brass Monolithic design has a mild recoil with power in the 1,911 FPS range out of an 18″ barrel. 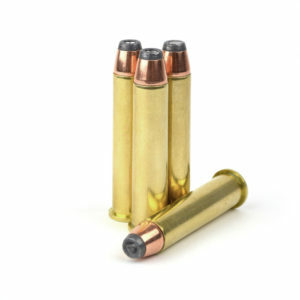 This round produces massive damage and a deep wound channel making this 45/70 ammo selection perfect for big game hunting while the mild recoil also makes this a go-to round for target practice. Comes with a solid brass projectile, new Starline Brass and premium powder. 45/70 Government Light Recoil 300gr. JHP Trapdoor – Made for Trapdoor Springfields, this 45/70 is ideal for all firearms that take the big 45-caliber round that are in good operating condition.